Don’t you just kind of wish this was in front of you right now? Because I kind of do. I am seriously mad at myself that I waited so long to share these with you guys. Like a whole four days or so. Now, looking through these pictures they are all I want to smell baking in the oven. The smell alone is reason to make them. It is so warm, cozy, comforting and fall. Cinnamon, sugar, vanilla and butter. Just reminds me of the holidays. Speaking of which, I am so not ready for. How is it that Christmas is in eighty days (I know this because I have not one, but two Christmas countdowns on my computer)? Yes, I am a little obsessed, but still not ready to start thinking about Christmas. I just want to enjoy Halloween and Thanksgiving first, and definitely all the pumpkin I can get my hands on. Somehow though, other than these easy as ever chocolate chip pumpkin cookie bars, this is the only other recipe that I have photographed with pumpkin! So crazy, because pumpkin is one of my favorites, but there are just so many awesome fall flavors. I want to show you guys them all but I am finding that there is just simply not enough days. Not enough days to show you guys all the fall foods I am dreaming up in my head. SO many that I actually have a hard time choosing what is best to show you. It’s such a rough life over here. I grew up with dutch babies. My mom is a freak for them, my grandma is a pro at making them and oh my gosh when they come out of the oven it is a total awe moment. They are huge and puffy and just gorgeous. But it only lasts for like 30 seconds to a minute. FYI, that is just too short for, slow as a turtle, me to snap a good photo. It just did not happen. But you get the idea! They are one incredibly huge puffy pancake. 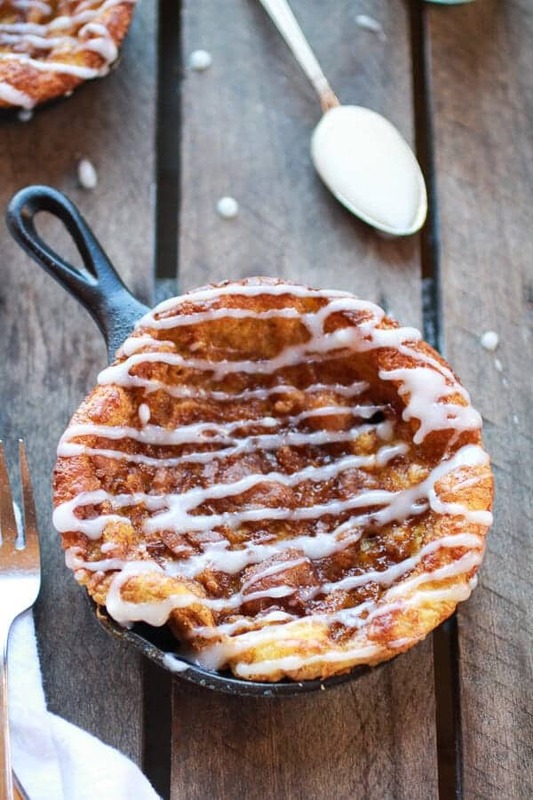 Except these dutch babies have a GIANT swirl of cinnamon, sugar and butter. Just like everyone’s favorite cinnamon buns. So amazing. Plus, they are so much easier than a cinnamon roll. No rising, rolling and more rising. 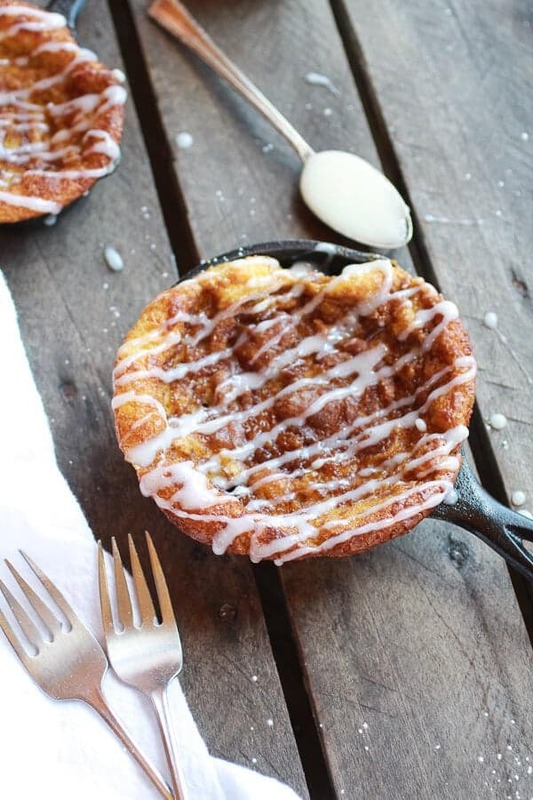 Just blend, pour, swirl, bake, drizzle and devour all in thirty minutes! I used mini skillets for these, but feel free to use a ten or twelve-inch cast iron skillet. They all work great, but the mini skillets were kind of fun. Just sayin. No rising, rolling and more rising. Just blend, pour, swirl, bake, drizzle and devour all in thirty minutes! I used mini skillets for these, but feel free to use a ten or twelve-inch cast iron skillet. They all work great, but the mini skillets were kind of fun. 4 tablespoons salted butter at room temp. 3 tablespoon cream cheese at room temp. 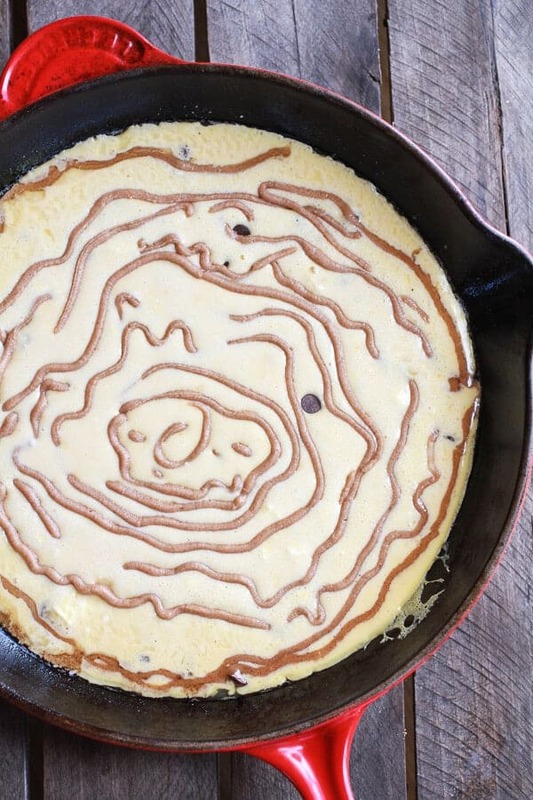 Place one tablespoon butter in a 9-12 inch cast iron skillet or 9 inch pie plate or 4 mini cast iron skillets. Place in the oven for 5 minutes. Put the flour, milk, pumpkin, brown sugar, eggs and remaining cold butter in a blender. Blend until well blended. Scrape down the sides and blend for about 30 seconds more. To prepare the cinnamon swirl mixture. Stir together the butter, brown sugar and cinnamon by hand or with a beater/mixer and add to disposable piping bag or plastic baggie with a small hole cut in the corner. While the dutch baby is baking make the frosting. In the bowl of a stand mixer, beat cream cheese, vanilla and powdered sugar together until well combined. Add milk and mix. Drizzle over the warm dutch baby. Oh and yeah, and around here they are of course studded with chocolate chips. What a sweet way to start the day! 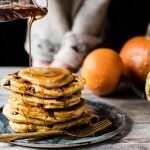 Chocolate Chip Pumpkin Pancakes with Whipped Maple Butter. 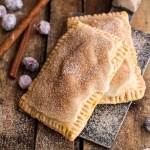 I love how adorable these are and between the pumpkin, choc, cinnamon-sugar, vanilla – I bet your house smelled amazing! Thanks so much, Averie! The house did smell pretty awesome! Thanks Norma! You have to make a dutch baby, so good! Granted it’s early (5:30 AM), but I’ve read through the recipe 5 times and can’t see how many chocolate chips you suggest. I could probably guess, but how many did you use? So sorry, I used 1/3 cup! I will fix the recipe now. Hope you love these! Yes,I totally wish this was in front of me with my morning coffee right now! Gorgeous! Omigosh! These are gorgeous and the ingredients aren’t anything too complicated. I’d love to try making them when I’m home over break! Thanks Rebecca! Hope you love them! They are the perfect thing to make over the holidays! Sweet goodness, this is straight up fabulous!! Oh girl, this needs to be in front of me NOW! Fabulous! Thanks Ashley! Wishing I could send you one! OMG, this is stunning! And individual skillets, I love that! Btw, your bloglovin feed doesn’t show a picture of the post, you might want to look into that; from what I know is a configuration thing. These look interesting even if I just love the basic ones SO much but my mission to educate lives on. I’m part German and my grandparents were full on, from Germany Germans so…calling a German pancake a Dutch baby just hurts my heart! 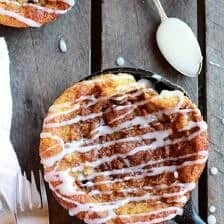 It was one persons attempt to popularize the German pancake; assuming the word Deutsch (German for German) would just be too hard for Americans to bear, it was shortened to Dutch which, as you can imagine, is most annoying to Germans because this popular pancake is now credited to the Dutch! He started a restaurant, made them in a smaller version, hence Dutch Baby. 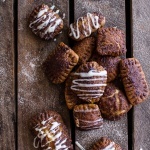 OK, now that I’m off my bandwagon I can tell you these sound good even if the chocolate chip part is too much for me in the morning; still, I could do cinnamon roll! The basic one is incredible, no argument there! But these are fun for a treat! I have to admit that these were totally a dessert the day I made them, but I am pretty sure we could do them as breakfast too. LOL! And about the name, I never knew!! This is always what my mom called them!! So happy you informed me of this. So a dutch baby is actually just a german pancake that was twisted into being called dutch? This is soooo soooo beautiful! I just LOVE these! Another drool worthy recipe! these look/sound so incredibly delicious! YES I so wish I had one sitting in front of me right now. especially in those little skillets! so freaking cute. I’ve seriously never had a dutch baby, but they always look so delicious. And just like you said, I’m sure they smell incredible!! Beautifully done. OHG! Make one! They are so good! This is a great way to use pumpkin! I’ve never made a dutch baby, but I have definitely drooled over photos of them quite often. This beauty is no exception – YUM! Oh my god you have outdone everyone everywhere who’s posting pumpkin recipes. This looks AMAZING. 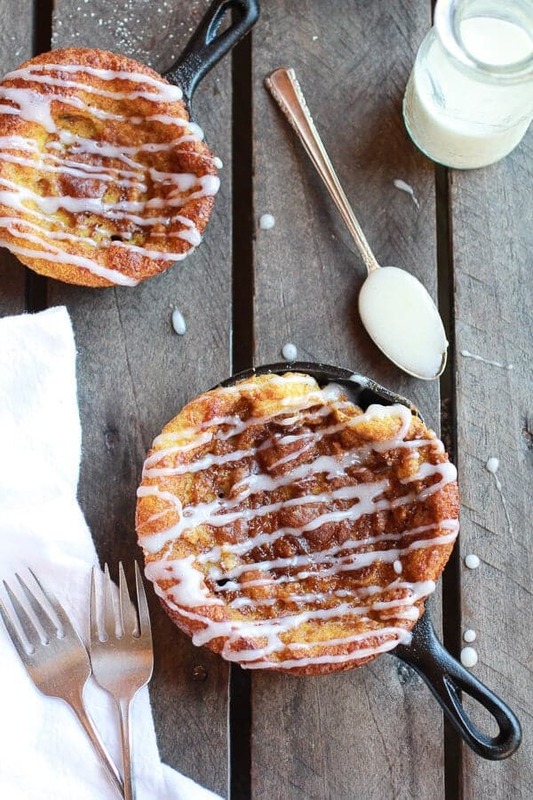 So brilliant to turn a dutch baby into a cinnamon roll hybrid!!!! Oh how I wish I were having this right now! I just came back from a buffet, so I am super stuffed right now, but I think I would still have room for this. Yum!! These are so adorbs. 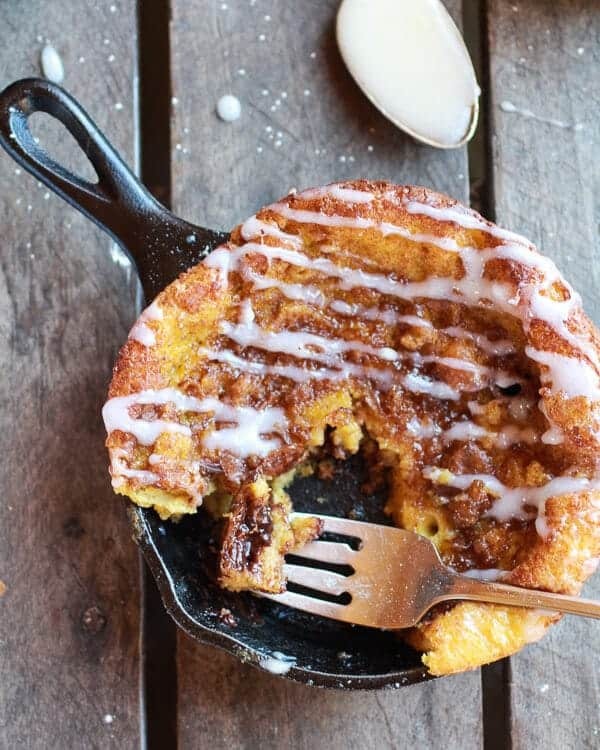 Love the little pans and although I’m not pumpkin crazy I can totally digg these! These looks so great! The photos look so yummy, I can’t imagine how they could make this look any better! Lovely. There are NOT enough days in the fall, I 100% agree! I can’t believe Christmas is only 80 days away?! This year is just flying by for me. And you too it sounds like! I love dutch babies – haven’t had one in so long Tieghan! 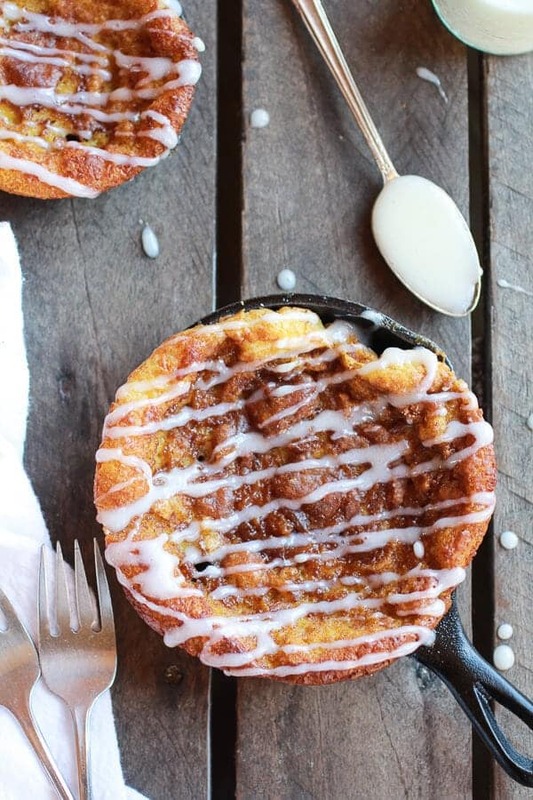 I just love the individual skillets and of course – the pumpkin/cinnamon roll combination. WOW! Can you believe I’ve never had a dutch baby? I need to remedy that, stat! Oh man, Dorothy!! You need to have a dutch baby, you will LOVE it! 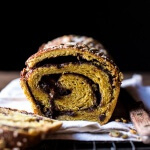 What a great way to use up that last bit of pumpkin! Looks amazing!! These look so good, I love the flavors and the mini skillets! haha! Yup, it sure is! This will be a star of my next brunch party, a stunner. You had me at the title of this post! O my goodness, these look like heaven in a pan. 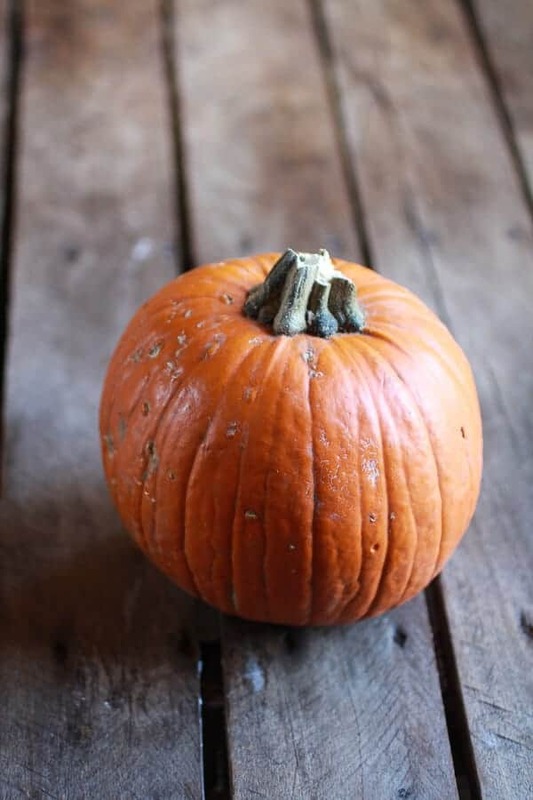 Pumpkin is my absolute favorite this time of year so I love when I see a recipe worth trying. Thank so much, Chelsea! I hope you love this! Uh yes, I absolutely wish this was in front of me! 🙂 This is such an incredible flavor combination. Again! Love it. Oh my! These look amazing! Love the flavors! Ummm, I TOTALLY wish this was sitting in front of me right now! Swoooon!! Thanks so much, Jocelyn! Wish I could make you one. Someday! Hey girl, you are super talented! Can I ask you where you get your photography baseboards? They are gorgeous gorgeous gorgeous. Did you make them/refinish them or purchase them like that? Thanks! THANKs!! My dad has actually made most of them for me and the others have been found all over the place at antique shops and junks yards. I am not a big fan of chocolate could I leave it out? Would it change anything? Yes, you can leave out the chocolate. Nothing will change. Hope you love this! Just made this and I don’t think I’ve ever tasted anything so great! Yummmmmm! Love your creative combinations!